This book presents the classic introduction to Acem’s theory and practice of meditation, written by the founder. 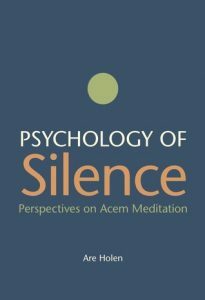 Psychology of Silence provides an easy-to-read account of the technique and its effects on health and personality. The book also includes chapters on meditative silence and the cultural background of Acem Meditation. The English edition has been thoroughly revised and updated, with two new chapters. The first: Diversity of Meditation Techniques compares different forms of meditation. It clarifies main characteristics of various techniques and what distinguishes them from each other. The second: Meditative Process explores the steps in deepening processes with longer meditations. Acem’s down-to-earth approach to meditation originated in Scandinavia in 1966 and is now taught on all continents. This approach is based on intensive experience, a user-orientated psychology of meditation, and scientific research on the relaxing and transformative effects of meditation on brain and body. Psychology of Silence was launched at the World Retreat this summer – where several hundred copies were sold. Read more or order the book. I was drawn to the title and am always interested in seeing meditation as something outside of just an Eastern tradition, so the Scandinavian angle sounds intriguing. Will take steps towards getting this book for my tribe!